Harry Reid has some explaining to do. No, wait - he should resign immediately! Senate Democratic leader Harry Reid collected a $1.1 million windfall on a Las Vegas land sale even though he hadn't personally owned the property for three years, property deeds show. In the process, Reid did not disclose to Congress an earlier sale in which he transferred his land to a company created by a friend and took a financial stake in that company, according to records and interviews. I wish I could make money off property that I don't own when it's sold - don't you? Senate ethics rules are clear in stating that members must disclose all investments, for profit or loss, on their annual reports. They must also report all financial stakes in companies, which Reid clearly didn't do. I can only imagine how quickly Harry would find the camera and microphone of the press if the person accused was - oh, I don't know - Tom DeLay? Karl Rove? Denny Hastert? And be assured that Harry would be calling for that Conservative to "resign immediately." I sure it's all above board. Harry's a Democrat! He wouldn't do anything illegal, immoral, unethical, duplicitous, misleading, underhanded, fraudulent, deceitful, disreputable, indecent,unprincipled, iniquitous, criminal, malevolent, indiscreet, malfeasant, crooked, dishonest, unlawful, shady, corrupt, tainted, dirty or self-serving would he? Noooooooooooooooooooo! Not Harry Reid. Not Harry! He's a Democrat! 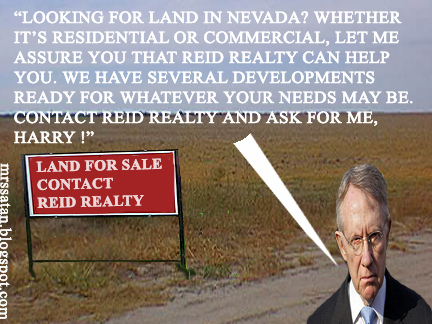 harry reid realty. dude that is so frekin' funny! ..."FOR ALL YOUR REALTY NEEDS.....!"